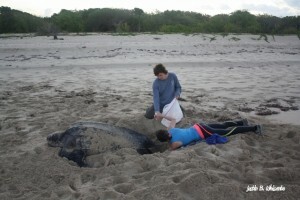 Molly Clifford removes Leatherback sea turtle eggs from a nest site as the female leatherback turtle lays them and transfers them to Jacob Hill, who places the clean eggs in a bag. Most sea turtle monitoring projects have several components of nightly beach work in common. These usually involve the identification and tagging of nesting turtles, collecting morphometric data, and marking and protecting nests. However, each project does things a little bit differently depending on the goals of the project and the threats facing that particular beach. Some beaches are concerned strictly with research and data collection, others primarily protect nests from poachers and predators, while others are focused on outreach and involving the local community in conservation. Here at the Sandy Point Wildlife Preserve in St. Croix, US Virgin Islands, rapid rates of beach erosion have made one of our primary goals the relocation of imperiled clutches of eggs to safer areas. While all sandy beach ecosystems are dynamic and constantly changing, Sandy Point is unique in that erosion rates are extremely high. 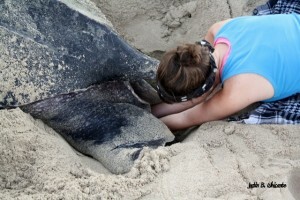 There are areas where the beach can erode more than fifty meters over the course of the six month nesting season. In these places on the beach, a leatherback turtle will come up and find what seems to be a perfect spot to nest because it meets all her criteria for an ideal nesting spot: a flat sandy stretch of beach above the high tide line that is free of debris and vegetation. But what the turtle doesn’t realize is that the spot is likely to erode and the eggs will wash away during the 60 day incubation period. Over the season, this could lead to a significant number of clutches being swept away by the ocean and preventing the eggs from hatching. have a fairly good understanding of patterns of sand movement around the beach. One section of the refuge starts out with huge expanses of beach at the beginning of the leatherback nesting season in March. As the season progresses, sand erodes away from this area (called the “erosion zone”) and is deposited around the other side of the shore (the “accretion zone”). Thus as the erosion zone shrinks during the season, the accretion zone becomes progressively larger. Because this pattern is cyclical and predictable, researchers over the years have developed a protocol to determine which clutches should be moved in order to maximize the number of hatchlings produced successfully on Sandy Point. 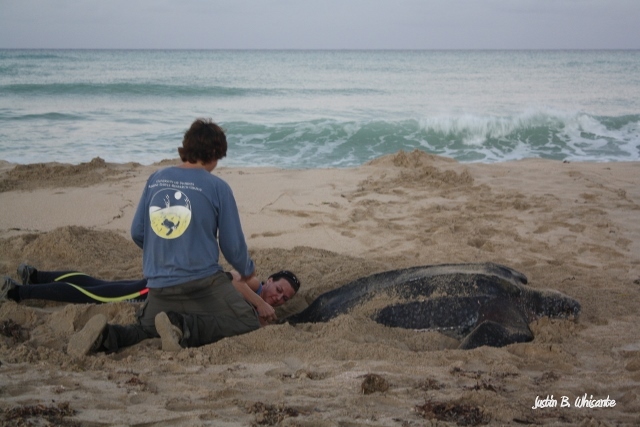 In just the past three years of this project, this relocation strategy has resulted in the survival of more than 10,000 hatchlings that would have been washed away if they had not been moved. 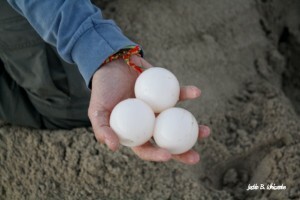 One out of every three nests is laid in the relocation zone and thus has to be moved to a safer area of the beach. This certainly makes patrolling a little more strenuous. In addition to the normal patrolling in the dark looking for turtles, we have the added element of carrying around bags of close to 100 eggs and finding a good spot to relocate them. But this additional work is well worth the payoff of knowing we have saved countless clutches of eggs and are helping to ensure the longevity of the nesting leatherback population on Sandy Point.